In a few days, I'll start shedding some light on vital Active Directory Security related matters that I believe most organizations seem to be in the dark about today. Until then, I just wanted to share some simple technical stuff on a few technical topics. My time is very valuable, and the only reason I'm going to spend any time on this is because we care deeply about the foundational cyber security of all organizations worldwide. In case you find yourself wondering as to what a free Active Directory audit tool has to do with foundational cyber security, I think you'll find the answer to that question here. Now that you know why this is important, you'll hopefully understand why I'm spending precious time on a blog entry on a free Active Directory Audit Tool. 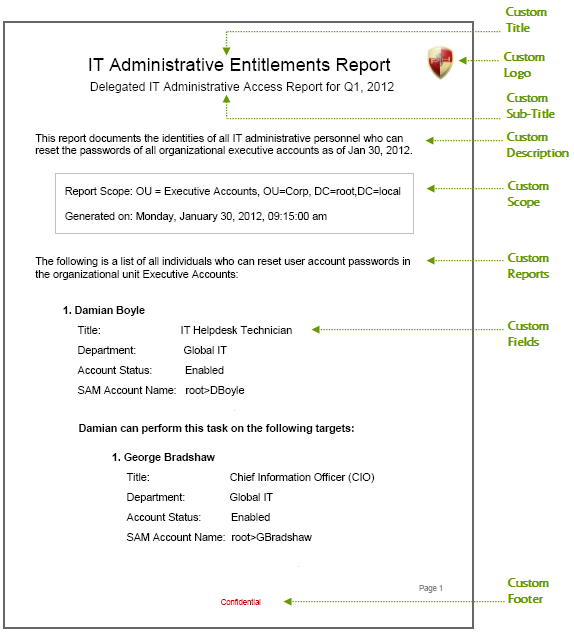 That said, the rest of this blog entry illustrates reports that IT personnel can generate from this tool. First things first. 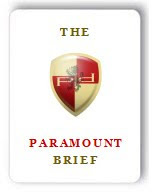 The tool can be downloaded from - http://www.paramountdefenses.com/free-active-directory-audit-tool.html. 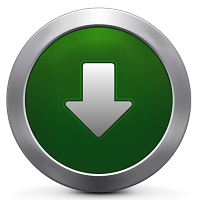 Our audit tool can be instantly downloaded and installed on virtually any computer in under 2 minutes. It does not require any administrative access or any changes to Active Directory to install, and it does not require any technical knowledge to use. The only limitation in the free version of our Active Directory Audit Tool is in its ability to perform data exports to CSV and PDF. 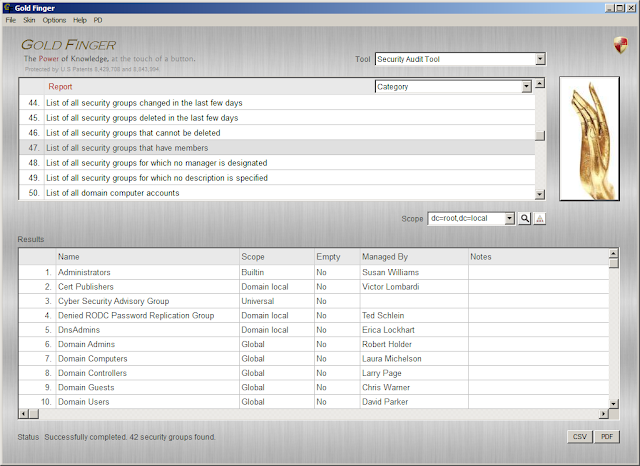 Step 1 - Select a report from amongst 100+ built-in Active Directory security audit reports. 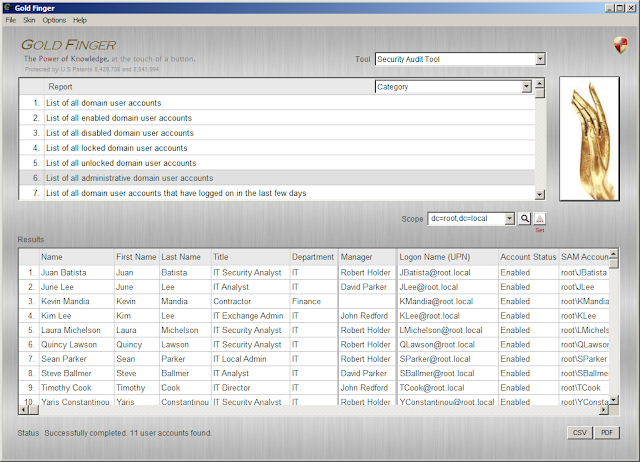 Step 2 - Enter the distinguished name of your target Active Directory domain in the Scope field. 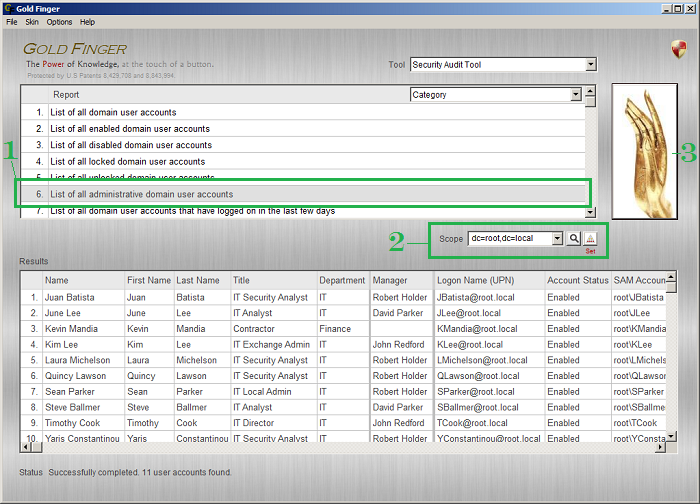 Tip - You can point Gold Finger to any OU, container, user account etc. 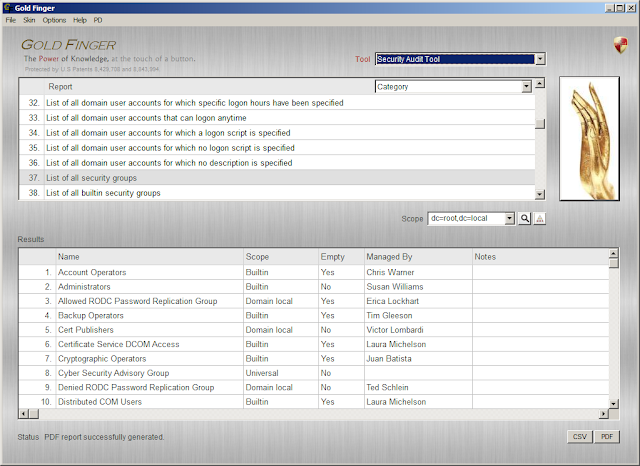 of your choice The inbuilt search utility can be used to instantly locate any object (and its DN) in Active Directory. You can also specify any LDAP filter, set scope (Base, One-Level, Sub-Tree) and restrict depth. Step 3 - Press the Gold Finger button. That's it. 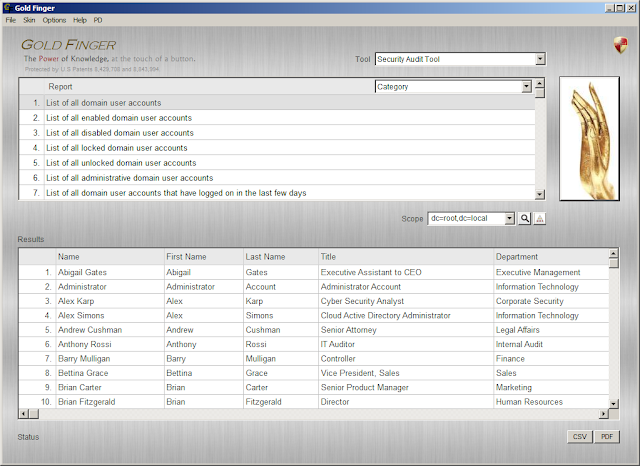 Gold Finger will instantly generate the report for you within seconds, and display the results in the Results Pane. Our free Active Directory Audit Tool was specifically designed to make it as easy as is possible for organizations worldwide to be able to fulfill a vast majority of their basic yet essential Active Directory cyber security audit needs. 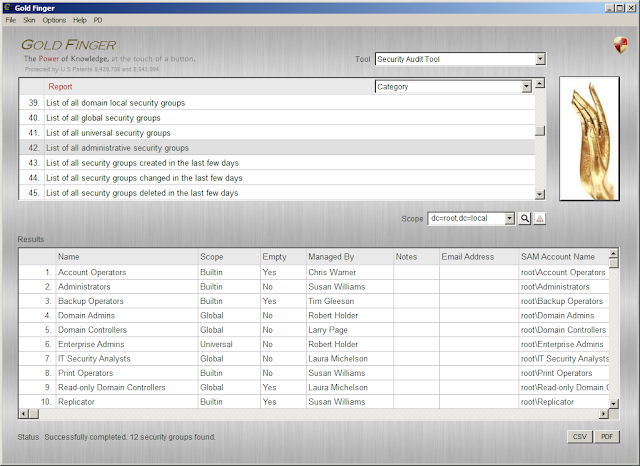 Gold Finger instantly retrieves and displays all domain user accounts in your Active Directory and displays all relevant attributes on every domain user account, including, but not limited to their name, title, department, last-logon time*, the date their password was last set, their contact info, email-address, logon name, account status, SAM account name, security identifier (SID), account expiration date, and other valuable information. Whether your have 1 domain controller or 1,000 domain controllers, Gold Finger will automatically determine the true last-logon time for every domain user account in the domain, based on the retrieval and comparison of last-logon values from every domain controller in the domain. Such a report could help identify domain user accounts against which an insider may possibly be trying to carry our a password guessing attack. However, sometimes due to an accidental change by an administrator, settings could accidentally be changed, resulting in a situation wherein some domain user accounts may not require a password to logon to. If a user could logon using someone else's account, he/she could potentially engage in malicious activity that could not be traced to them. Such a report could help identify such accounts. 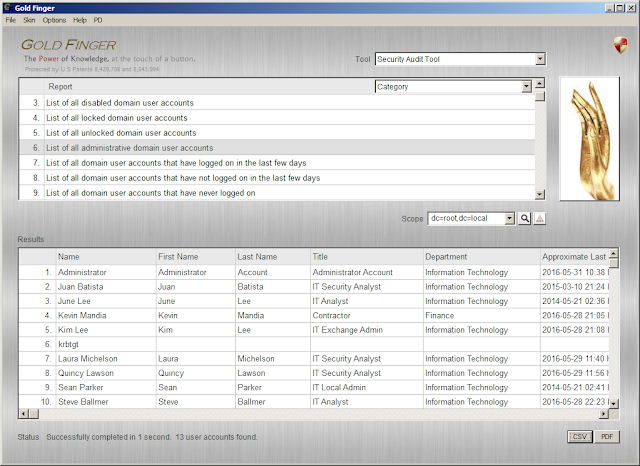 Active Directory user accounts that have not changed their password in the last 90 days. Such a report could help enforce an established organizational password policy, which for instance, may require that all domain user account holders change their passwords every 90 days. With Gold Finger, the number of days for all time-based can range up to 5000 days. Active Directory user accounts that do not have an expiration date. It is generally desirable to ensure that domain user accounts have an expiration date set. Such a report could help identify any domain user accounts that do not currently have an expiration date. 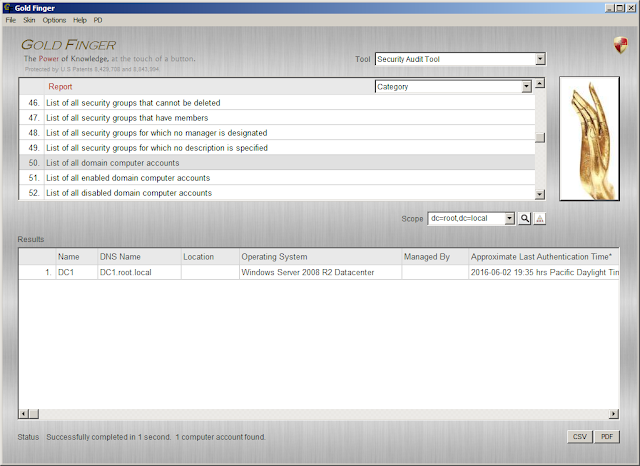 Active Directory user accounts that are not sensitive and can be delegated. Active Directory user accounts that can long to any workstation. In general, at the very least, administrative accounts should have designated workstations and ideally should not be permitted to logon to other workstations. This advice is primarily intended to help organizations minimize the possibility of Pass-the-Hash (PtH) attacks as well as Kerberos ticket replay related attacks. Active Directory accounts considered by Active Directory as "administrative". At the very least, all organizations must know at all times, exactly who is effectively provisioned what level of privileged access in their foundational Active Directory. While most organizations are not there yet, at the very least they should be able to identify exactly which domain user accounts in their Active Directory are considered "administrative" by Active Directory. This simple report can help them make this determination in seconds. 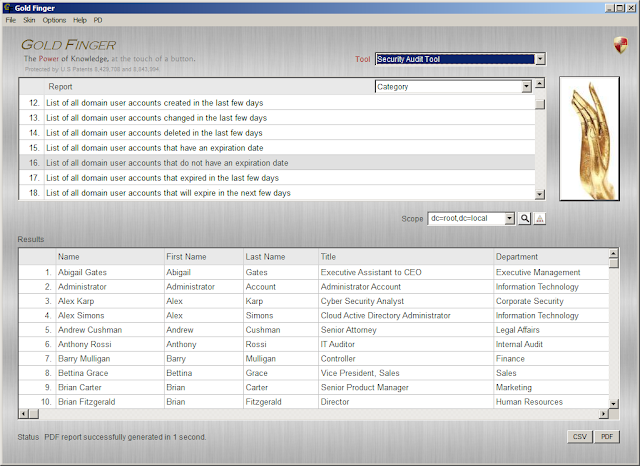 For advanced users, this report can also help them identify orphaned AdminSDHolder objects/accounts. 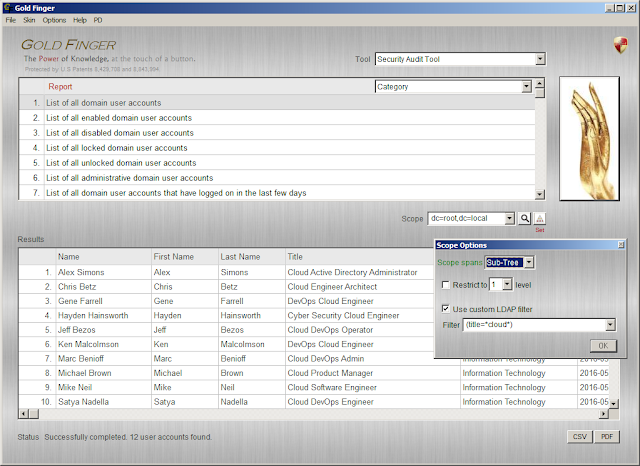 All executive domain user accounts in Active Directory. This report is a good example of how you can focus Gold Finger on any organizational unit. For instance, in this case, all executive user accounts are located in the Executive Mgmt OU, so by focusing Gold Finger on this OU, you can instantly enumerate all domain user accounts in the OU. Alternatively, the same report could also be generated by focusing on the domain root and adding an LDAP filter such as (title=Chief*Officer) with any domain user account management reports. 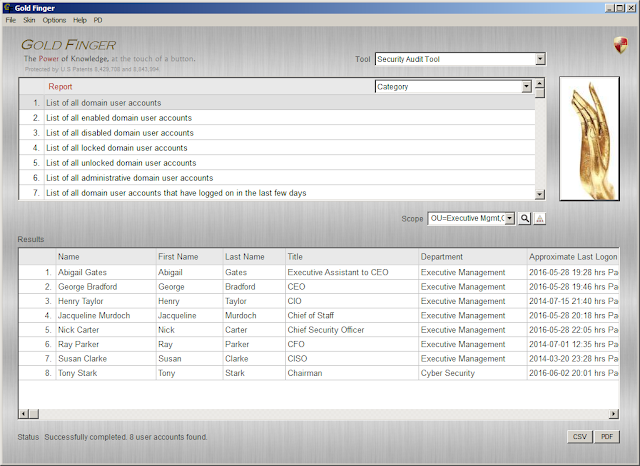 The CEO's domain user account in Active Directory. 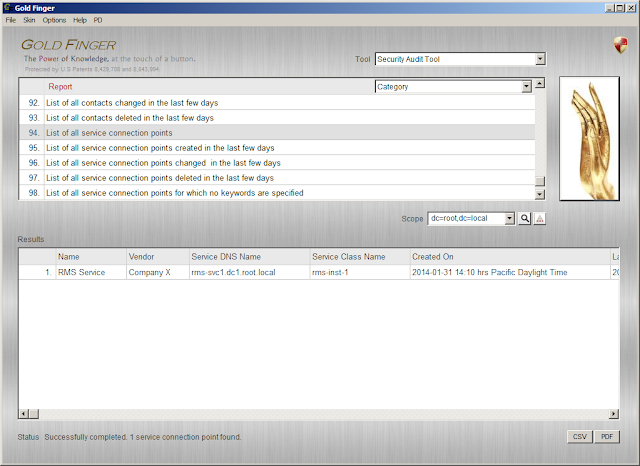 Similarly, you can focus Gold Finger on any object in your Active Directory, such as a domain user account, a computer account, an OU, a service connection point etc., as well as view its details. List of all computers joined to Active Directory. 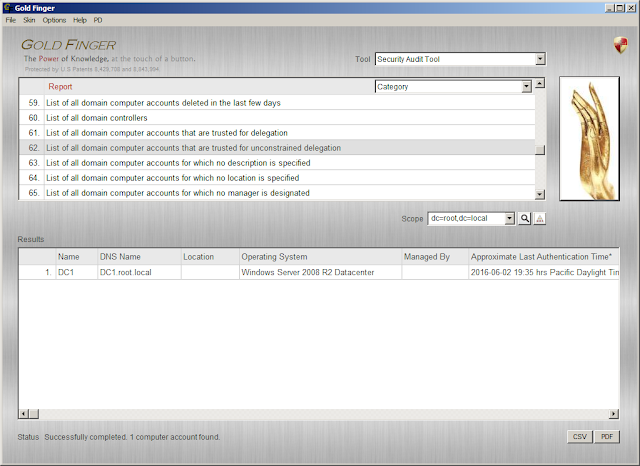 For each domain computer account in Active Directory, Gold Finger will retrieve and obtain all relevant attributes such as the computer's name, DNS name, location, operating system, who it's managed by, the time it last authenticated, its SAM account name, Security Identifier (SID) and other relevant details. Domain-joined computers that are trusted for unconstrained delegation. This report could help you identify all computers, that if compromised, could potentially be used to impersonate any domain user account who could be lured into being a client of an application running as System on this computer. A knowledgeable perpetrator could easily use this information to identify prime entry-level targets in your Active Directory. List of all Domain Controllers in Active Directory. For each domain controller, Gold Finger will retrieve and obtain all important attributes including their DNS name, location, operating system, who it's managed by, the time it last authenticated, its SAM account name, Security Identifier (SID) and other relevant details. 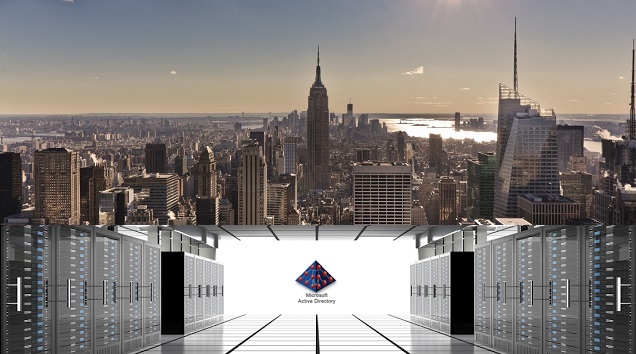 Of course, with our advanced tooling, you can instantly obtain substantially more high-value information, such as who can change the group policies linked to the Domain Controllers OU, or obtain administrative access over the domain computer account of a Domain Controller to then be able to easily elevate their privilege to that of a Domain Admin /Enterprise Admin rather easily. List of all domain security groups in Active Directory. 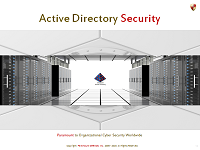 This report could help you identity how many domain security groups exist in Active Directory, who's responsible for managing them, where in Active Directory they are located, etc. 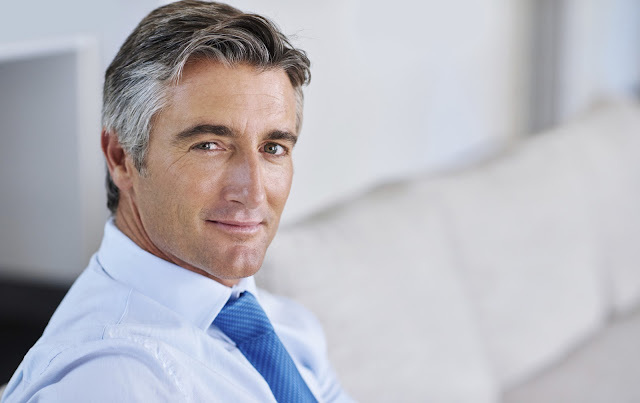 Of course, with our advanced tooling, you could also easily enumerate their memberships, analyze their ACLs, find out where they have permissions in Active Directory, determine who can change their memberships, as well as who can control all of them, at the touch of a button. List of all domain security groups considered "administrative" by Active Directory. At the very least, all organizations must know at all times, which domain security groups in Active Directory are considered "administrative" by Active Directory. Although this is merely the tip of the iceberg, this simple report can help them make this determination in seconds. In general, organizations that need to be able to identify all privileged users/groups in Active Directory can do so based on our advice on how to correctly identify privileged access in Active Directory. List of all non-empty domain security groups in Active Directory. List of all organizational units in Active Directory. Such a report could help ensure that management responsibilities for all OUs are assigned to someone and adequately covered. List of all organizational units within a specific organizational unit. For instance, the snapshot above shows how to easily enumerate the list of all OUs in the USA OU. List of all OUs that are within 3 levels of depth away from Active Directory. Such a report could help IT personnel easily enumerate all high-level OUs in your Active Directory, that might possibly contain a large number of Active Directory users, groups, computers etc. 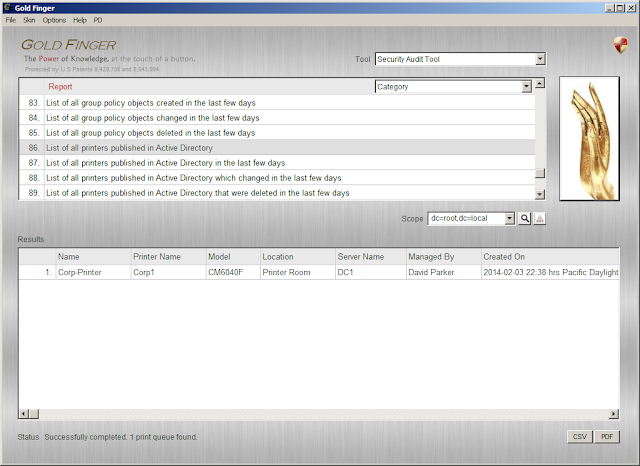 List of all group policies in Active Directory. List of all printers published in Active Directory. List of all service connection points in Active Directory. List of all objects in Active Directory. 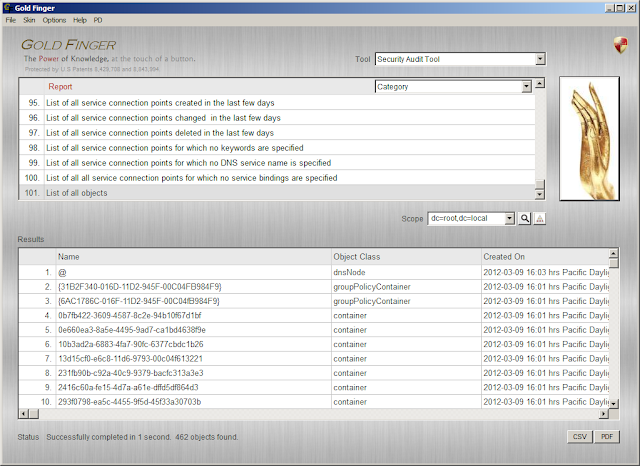 This report can be focused on any tree in any partition, including the Configuration and Schema partitions, so for instance, combined with an LDAP filter, you could audit everything from the list of all Sites in the Configuration container, to all Schema classes in the Schema, to all authenticable security principals in your domain all identified in a single report. Scope options in Gold Finger. 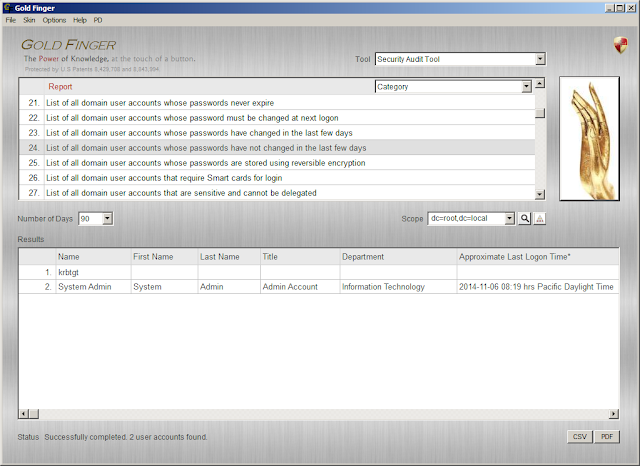 I should also mention that you can not only focus any security audit report available in Gold Finger on any domain, organizational unit, container or object in Active Directory, you can also apply a custom LDAP filter to every report as well as specify the scope, and set a custom depth level. With our free Active Directory Audit Tool, you can do this in any domain in the world today, for free. 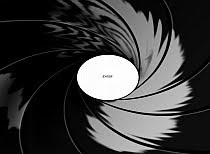 I should mention that Gold Finger's Security Audit Reports are only 1% of what Gold Finger is capable of and was designed for. We primarily built Gold Finger to help organizations do what no other entity (company, vendor, group or individual) in the world can help them do i.e. correctly identify who effectively has what privileged access across an entire Active Directory domain. Again, the only reason we're even spending 5 minutes on sharing more about our free Active Directory audit tool is to protect 1000s of organizations worldwide from potentially being compromised by the use of untrustworthy (malicious) tooling. 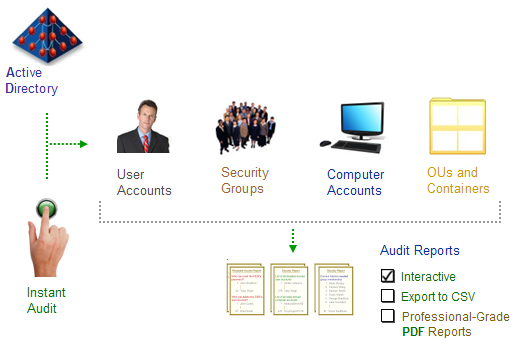 It might be helpful to know that with a simple upgrade to a paid license, the results of every report available in our free Active Directory Audit Tool can both, be instantly exported (in CSV format), as well as you can also generate completely customizable professional-grade PDF reports, complete with custom headings, fields, logo, footer, password etc. 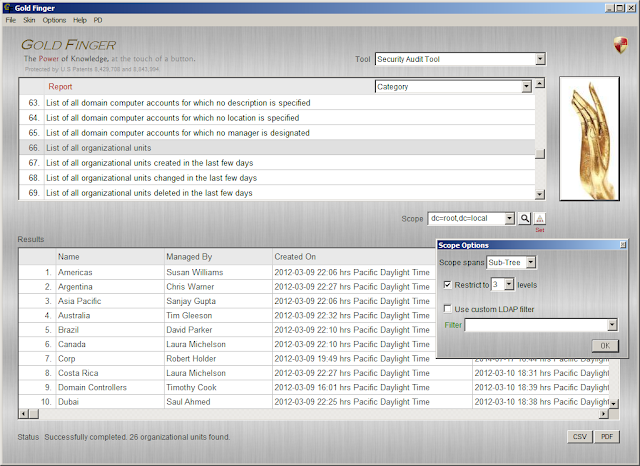 Fully-automated Active Directory security audit report generation. 1. Instantly, easily and trustworthily perform a complete or custom inventory of Active Directory content. 2. Easily audit the state, status and settings of any, some or all resources stored in Active Directory. 3. Efficiently, cost-effectively and trustworthily fulfill all basic and essential Active Directory security audit requirements. 4. Obtain 365-24-7, on-demand, real-time insight into the security state of all vital IT resources and content stored in Active Directory. Of course, we also build simpler Active Directory audit tools including the world's best Active Directory Permissions Analyzer, Active Directory ACL Viewer/Exporter, Kerberos Token-size Calculator, and a Group Membership Enumeration tool. As the world's top cyber security company, we care deeply about security and trust, so we go to great lengths to set the gold standard when it comes to the trustworthiness of the software we build for the world. We also believe that all organizations deserve to have a trustworthy option when it comes to free Active Directory Audit Tooling, which is why we decided to build and make available a free version of our tooling. So there you have it. My time's up - that was a quick 5 minute overview our free Active Directory Audit Tool.